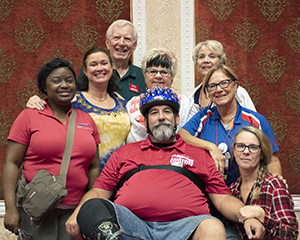 It only takes five people dedicated to Inspiring Mobility and Independence in your community. We have found that the most successful chapters have a diverse membership from all walks of life and with varied talents. You’ll want to choose a head delegator & motivator (president), member tracker (secretary), and money tzar (treasurer). Chief fundraiser is another key role; someone to plan events and build community relationships. 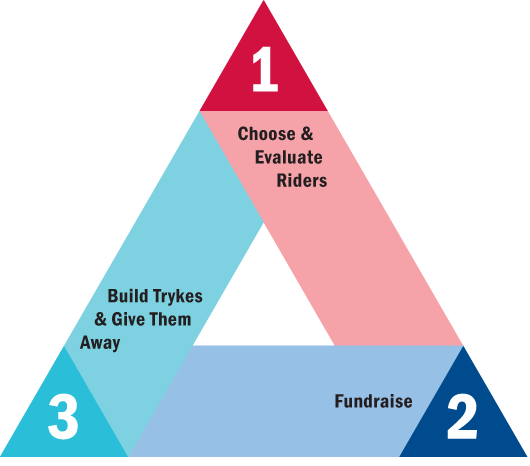 The idea of your group building an Amtryke program in your community may seem overwhelming but we encourage chapters to think of the process as three steps. Choose & Evaluate Riders — If your core group doesn’t contain physical or occupational therapists, contact local clinics and hospitals, tell them about the Amtryke program and ask for their help identifying and evaluating recipients. 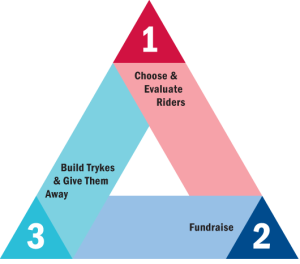 Build Trykes & Give Them Away — Building the trykes is a great team-building exercise and member recruitment opportunity. And of course the Giveaway Day makes all your hard work totally worth it. There is nothing like those smiles! New chapters often start out going through this process once a year and then begin cycling through two or three times — adding more recipients as capacity builds. Also, we’ll give you ten free trykes! Really! We call it our 10-for-10 promotion. Each time you fundraise for and purchase a tryke, we’ll give you another tryke of equal or lessor value (excluding shipping and accessories) for free. 1. Each member of the chapter is required to pay a $10 new member fee. Your chapter will be invoiced for this fee toward the end of the chapter set up process. 2. AMBUCS members’ national dues are $25 per member, per year. This is billed quarterly based on the AMBUCS year (June, September, December and March) NOTE: the new chapter is exempt from dues for the first two billing cycles (6 months) after its charter date. This helps you build local funds without collecting dues from your new members. 3. Chapters are grouped into Regions. Your National Board representation is through the region. There are usually some dues associated with region membership, and some regions have assessment fees to support their region conference. You’ll be advised of this once you charter or ask the ARC at any point. You are exempt from these costs for the first two billing cycles (6 months) after the charter date. 4. Some areas also offer Districts (smaller groups of chapters within region areas). Membership in the district is optional for new chapters. If your chapter is in a district, there may be additional district dues. Ask your sponsoring chapter, sparkplug or the ARC for this information, and then decide if district benefits and costs work for your chapter. A new chapter is also exempt from these charges for the first two billing cycles after charter date. 5. The only other cost involved is the chapter’s liability insurance premium. Once the new chapter is officially recognized, the chapter will receive an invoice four times per year (at the quarterly billing) for $26. That’s a total of $104 per year (it’s not per person) for very robust liability insurance coverage for both members and volunteers. 6. The core group of members may want to consider having some sort of chapter dues or fundraiser which is retained by the local chapter to cover operating costs. We have a sample chapter budget so chapters can anticipate what those operating costs might be. If you’re interested in learning more, check out the Amtryke Frequently Asked Questions and see the much more detailed explanation below. Feel free to reach out to us with any unanswered questions. Ready! Let’s Build a Chapter. So, you’re ready to build an AMBUCS chapter? Now all you need to know is how! Never fear, AMBUCS has been very successful building new chapters using the techniques outlined below. Recruit at least four others with a passion for Inspiring Mobility & Independence. Choose three possible chapter names. Submit the New Chapter Application. To begin, you must identify a leader who is interested in Inspiring Mobility & Independence in your community. This may be you and you are already committed to the project. Often the leader is a therapist but may be a friend or relative or simply someone passionate about the mission. Your lead person must be willing to help organize the initial mission-focused activity. You will then want to recruit a core group of 5‐10 people. From this core group, your first set of chapter leaders must emerge. Identify the Key Roles that will benefit your chapter and recruit people who will assume these roles and duties. Many can be combined. How will you Inspire Mobility & Independence in your community? 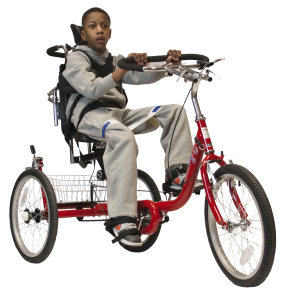 While the Amtryke Adaptive Tricycle Program is at least a portion of the mission focus for over 90% of our chapters, it is far from the only option. National AMBUCS also administers a Scholarships for Therapists program. Many chapters sponsor students and fund scholarships. Contributing to a therapist’s education has an exponential reach, since each therapist changes thousands of lives during their career. Many of our chapters choose or incorporate Community Service as part of their mission focus. This can take on an infinite variety of forms. There are two wonderful projects, while not offered across the nation or supported directly by the AMBUCS Resource Center (ARC), are still frequently chosen by chapters: Building home access ramps or accessible playgrounds. Amtryke Coordinator – keeps the paperwork correct, liaison with the therapist team, order bikes, schedule builds and giveaways and be the main point of contact to the public for requests. Scholarship Coordinator – liaison with local colleges or universities with therapy programs, screens candidates for sponsorship (on the National level) or local awards, coordinates any student volunteer opportunities and be the main point of contact to the public for requests. Ramp Coordinator – keeps up to date with building codes, procure materials and tools, schedule builds and volunteers and be the main point of contact to the public for requests. Newsletter/Communications – handles internal and external communication. Vice President – mentee and helper for the President. Will assume the role next chapter year. Second Vice President – mentee and helper for the President. Will assume the Vice President role next chapter year. Big Hat President – President of the optional honor club within the chapter. Read more about Big Hat here. Big Hat Sec/Tres – Sec/Tres of the optional honor club within the chapter. Therapist(s) – If your core group doesn’t already contain therapists, we strongly recommend recruiting one or several to conduct Amtryke evaluations and fittings. These could be community connections, rather than members. Fundraiser – someone to plan events and build community relationships. Grant writer – someone to develop this fundraising tool at the local level. (can be combined with Fundraiser). Head Amtryke assembler – someone mechanically inclined who will lead Amtryke assembly for the chapter. This person could be a community connection, rather than a member. 4. Pick a Chapter Name…and then two more. All chapters are legally named as the ________________________ Chapter of National AMBUCS, Inc. You cannot include the names AMBUCS or Amtryke in what you choose to put in that blank, but you can use a variation like tryke(s) or tryker(s). You will probably call yourself __________ AMBUCS or just by the name you choose, informally, but the IRS will know you by that whole mouthful above. You will list your three possible chapter names in order of preference. We will only move on to your second choice (and then third) if your secretary of state refuses to allow us to file your Articles of Incorporation with that name. Sometimes that happens if the name chosen is too common in your area, is taken or could be confused with another organization. 5. Let Us Know You’re Ready! When you have your members, officers and chapter names ready, fill out and return the New Chapter Application. The application gets the ball rolling and prevents another group in your area from starting without you! After we receive and approve it, we will get to work. Here are the steps the AMBUCS Resource Center (ARC) takes on your behalf once the application is approved: We will apply for your Articles of Incorporation and complete your Charitable Registration with your state, once approved we will file for your EIN with the IRS, we will email you the organizational paperwork to be completed and returned and, after adding the chapter and members to our system, we will mail some promotional materials to get you started. All these steps (except filling out the organizational paperwork) MUST be completed by staff at the ARC. Please do not complete any of these steps on your own. Once you fill out the New Chapter Application, we will process it and go to work on your behalf (as described above). Soon afterward we will email you the organizational paperwork. There will be detailed instructions in the email. It will also include your Affiliation Agreement, Chapter Bylaws and (optional) Chapter Policy Guidelines. Chapter officers should fill these charter documents out carefully and with due consideration. Please keep a copy of these documents for your chapter’s permanent records. Because our Group Tax exemption is predicated upon each chapter adopting the standard bylaws and articles of incorporation as approved by the IRS, you must adopt the standard documents. Your first project should be to get a group of people to attend and participate in an event. It might be your first ramp build, community service project or Amtryke event. If your group contains therapists (or has therapists contacts) who are already comfortable with the Amtryke Program, you might consider holding an Evaluation Day. At this event riders would be evaluated by the therapists for the best tryke and accessories for them. You would then ask for quotes for the bikes chosen, which would give you your first fundraising goal. Even though the riders don’t go home with the bikes, this is still a great event to create community interest. If your group does not contain therapists, does not have therapist contacts or the therapists do not feel comfortable evaluating riders, you will want to focus your efforts on either a therapist training or on a Road Show visit. Before you begin planning with a specific date in mind, reach out to the ARC to settle on a date that works for you and when a trailer and/or trainer will be available. If your group will focus on providing Amtrykes to Veterans, you might consider hosting a regular ride. You can invite food vendors and even service providers to attend. Many chapters invite Veterans of all abilities and on any bike or tryke to participate. Regardless of your focus, this step requires emails, social media notices, and maybe even letters or phone calls to build community awareness and support. Focus on area therapists, parent groups of people with disabilities, community leaders, possible donors and the media. If it is an Amtryke event, consider contacting bike shops and others who are mechanically inclined who might volunteer time to build bikes in the future. If you can, involve the local media! Send a press release as a Word document a week before your event and then follow up with a phone call a few days before. More tips on gaining media coverage. Recently there has been some success giving away one tryke the day before the event and mentioning during coverage that anyone who would like to get involved can drop by the later event. As you get up and running, please be sure to refer to the documents listed below. If you would like any of them printed for you and mailed with your promotional materials, please let us know. You may want to bookmark these pages in your browser. 1. Chapter Toolkit – a guide to nearly anything you’d ever want to know about how to be a chapter. Please pay particular attention to the Chapter Officer Guidelines. 2. Award Guidelines – participating in the awards program is optional but it is an effective way to ensure your chapter will be successful. 3. Tips for Setting Up Your Chapter Bank Account – it can be a little more difficult than it should be. But these are terrific tips to get you on the right path. The document also contains sample chapter board meeting minutes. 4. Monthly Planning Calendar – you will find the calendar and several other helpful resources linked on the Admin Documents page. 5. Forms – nearly all the information we get from you on a regular basis come to us via one of these forms. 6. Marketing Downloads – don’t miss this page of the website. You will find video links, customizable templates (like letterhead and flyers) and instructions for submitting a chapter story to the AMBUCS Magazine. 7. ARC Contact List – this handy page lists all employees, contact info and which questions to ask each person. Service Area – Don’t bite off more than you can chew. As you grow, you can always make your service area larger but it is very difficult to make it smaller after you get your community excited about Amtrykes! For large metropolitan areas, consider serving only a few sections of town at first. For smaller areas, consider serving only your town or a county or two. Selection Criteria – How will you choose who to serve and how? This is your decision. Chapters handle this in many different ways. Who. We would like to serve everyone that needs us but that is often just not feasible. If you burn yourself out trying to serve everyone, no one will be served. Some chapters only accept Amtryke requests from one therapy partner while others accept requests from all over town. Most set some sort of restrictions to help keep their chapter wish list manageable. Setting restrictions like: rider must not be able to safely ride a traditional bicycle or the parent/guardian/rider is committed to using the bike, etc. They often also impose limits on their therapy partners (say 5 a year from each facility). How. Some chapters will not accept funds from families for their bike but will allow donations to another person’s bike (paying it forward). Some have a policy of asking how much the family would consider paying for a regular bike for their child and to consider put that much toward it if they can. Meetings – Some chapters meet once a week while others meet once a month or even less. Chapters with weekly meetings often eat a meal together and have a guest speaker from the community. Other chapters meet only as necessary to conduct business: fundraise for and giveaway Amtrykes! Chapters that meet less often usually stay in touch via email, phone or skype as they work on projects. Most of all – get the core group together and have some fun. Plan a fundraiser! Figure out how to take advantage of the Amtryke 10-for-10 program – where you earn free Amtrykes for your first giveaways. Make plans to attend your Region Conference in the spring and/or National Conference in the fall. These events offer invaluable training opportunities. Please reach out to us if you are interested in learning more or have any questions.